That’s right! Our home brew is traveling out to SXSW with L.A. Record for “The Ever Loving Party” March, 19th, 12-7pm @ Design Within Reach, 78701. Sorry it’s refreshment for bands only – but the show seems like an insane line up: Acid Mother’s Temple, The Growlers, Leslie & the Badgers, and more! 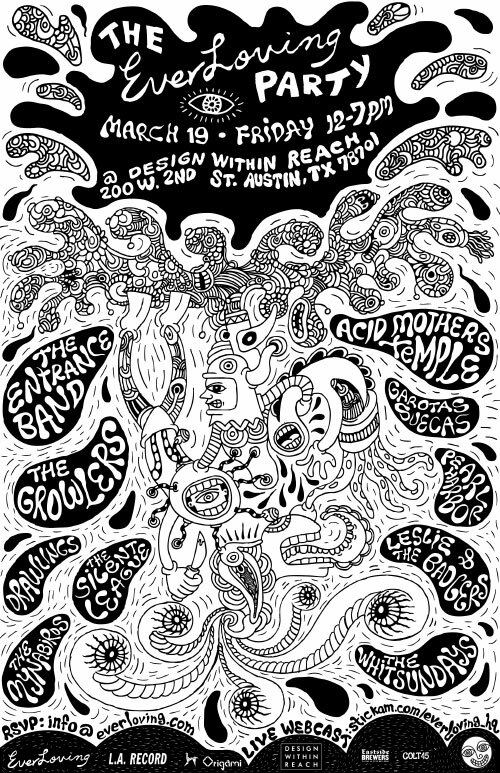 Check it out if your in Austin for SXSW. 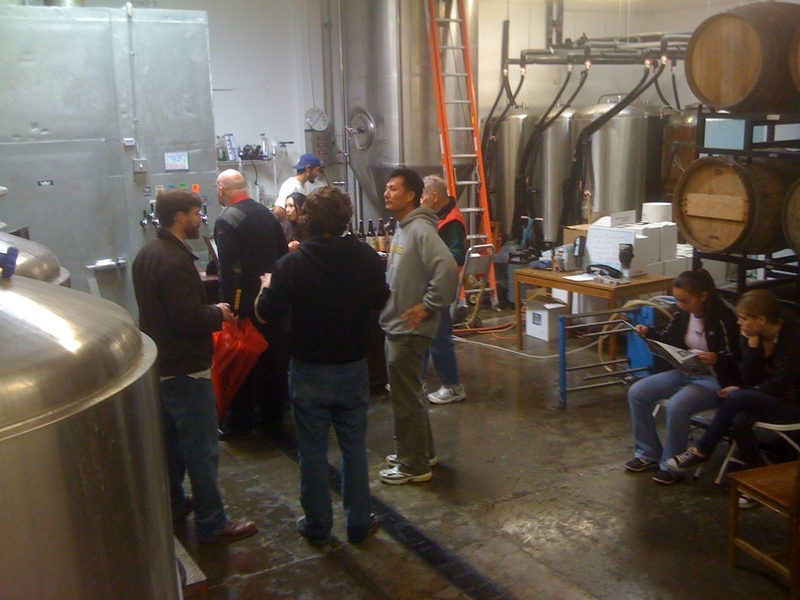 This past Saturday, Eastside Brewers headed down to Fullerton to check out Bootleggers Brewery. Two of us had met the new Assistant Brewer Chris, in Seal Beach at Beachwood BBQ – he was super friendly and invited us down – so, instead of brewing this weekend, we headed out to the brewery (and then we went to Beachwood for lunch and more tasters!). Tucked away in a small office park a few blocks from downtown Fullerton was this great brewery, dreamed up by Aaron Barkenhagen, and built with sweat and dedication. They recently took over the warehouse next door and are working on their permits to serve pints! 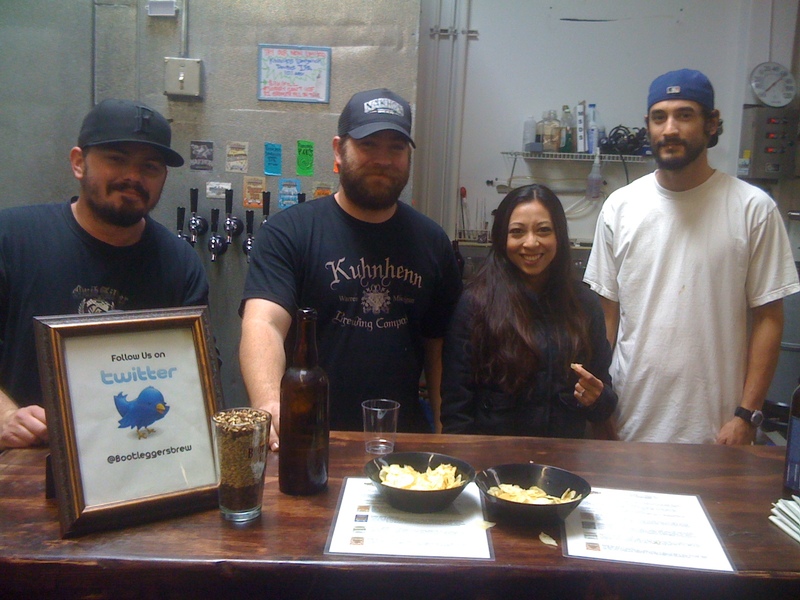 The beer tasting was great, we tasted nearly 10 on draught and a couple of bottle conditioned treats, all were solid. The double IPA (10%) was a great example – hoppy and full bodied, their winter beer with mint was awesome, their lemon grass beer they do for contract rocked, and the hefe was balanced to the clove side. Both bottle conditioned beers were tasty – especially the plum beer. So, if you’re in the OC, you should check ’em out. Hopefully they’ll be showing up in more of your favorite beer bars soon! And maybe even at the LA Craft Beer Festival in May! 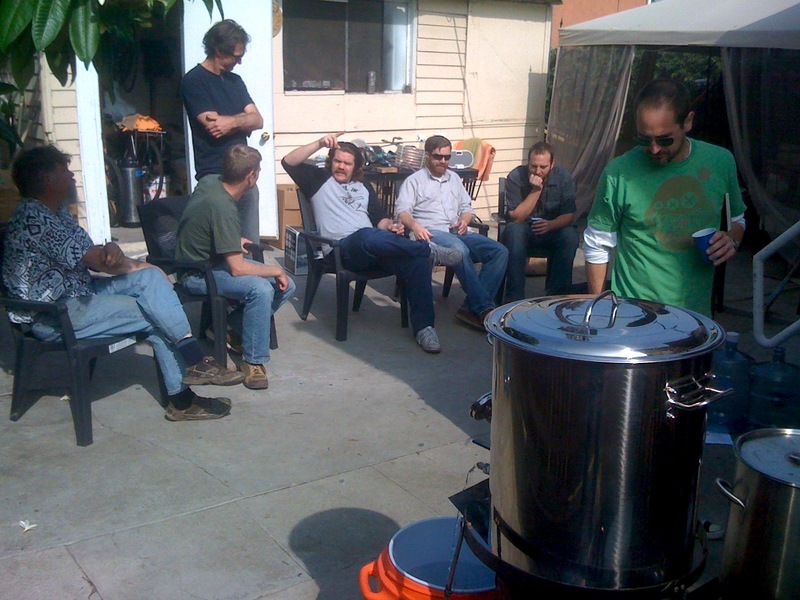 Recently a couple of us brewed up a 10 gallon batch of imperial stout. The plan was to oak the stout after fermentation. We brewed the 10 gal. and then split it into two 6 gallon carboys for fermentation. Our ferment did not attenuate fully, so we ended up with 5 gal. @ 1032 and 5 gal. @ 1022 (wanted to hit 1018). With fermentation complete we prepped the oak cubes (american medium toast) by soaking them in high proof bourbon (Baker’s Bourbon) for sanitation. 1 oz of oak cubes (w/o the bourbon) went into each corny keg and we racked 5 gal of stout into each. After 7 days the oak flavor was where we wanted it to be – now time to transfer the beer off the oak. Our plan was to blend the two kegs together so we would balance the two F.G.’s together. 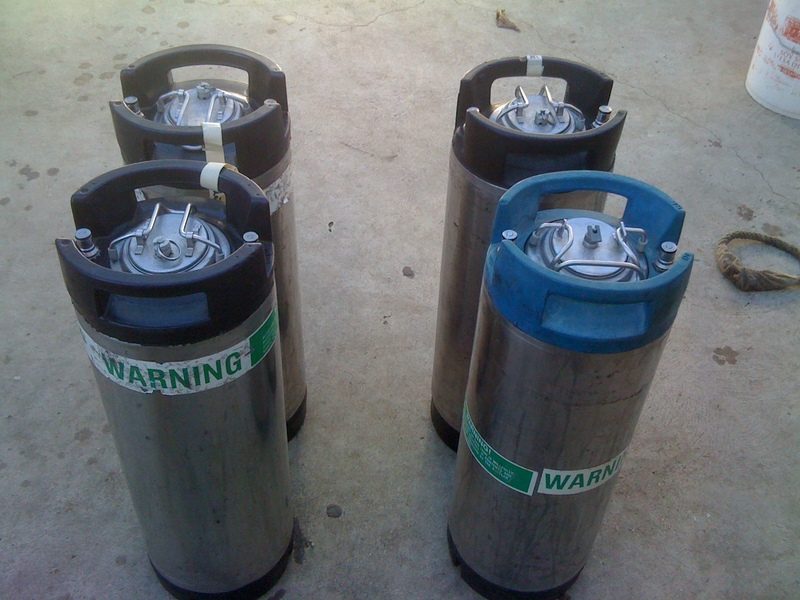 Step One: 2 Kegs w/beer (on the left) & 2 Kegs w/o beer (on the right). Step 2: Jumper cable with two outs (black connects). Connect to the out of the full keg and to the out of the empty keg. 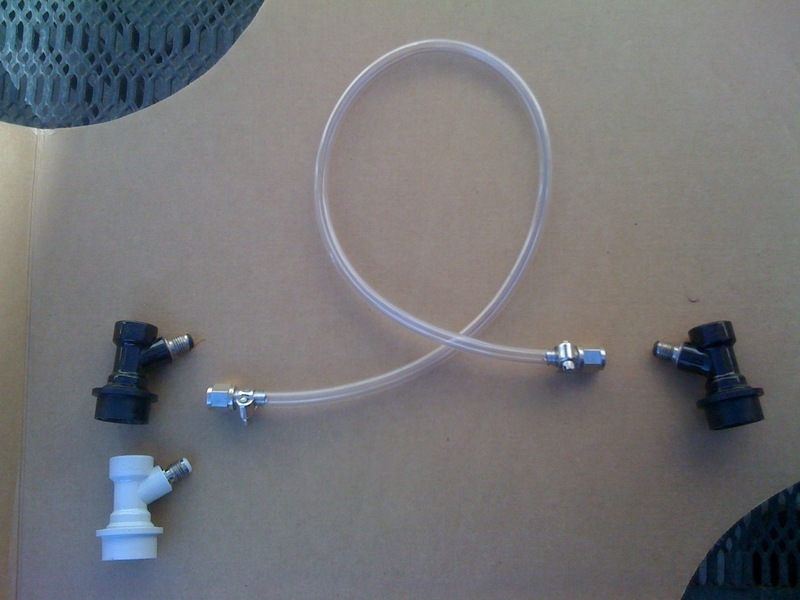 You connect to the out of the empty keg so that the beer fills from the bottom of the keg, not sprays out from the top of the gas in connect. Also, on the empty keg, be sure to open the release valve so that the pressure is lower in the empty keg than the full keg and the beer flows. 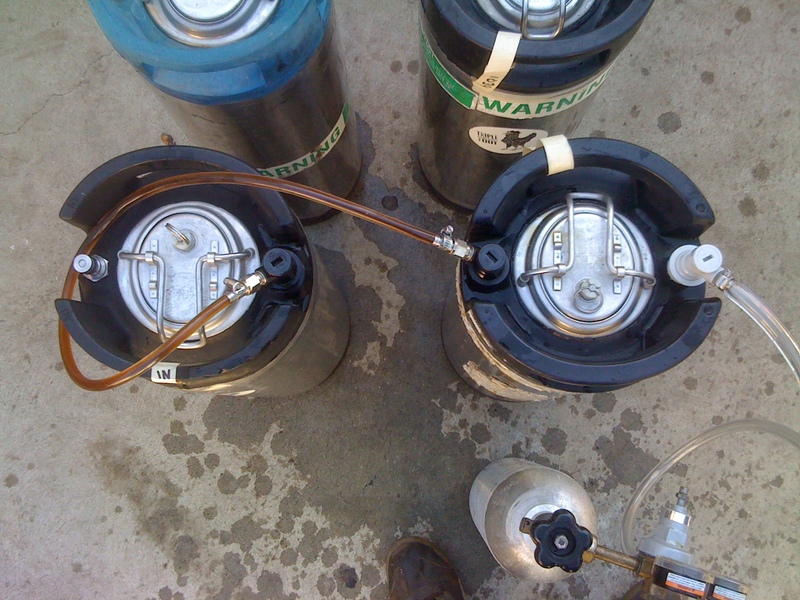 Step 3: Push beer from full keg to empty keg using CO2 10psi. We filled each keg with 1/2 of the higher gravity and half of the lower gravity beer so that they were of equal strength/taste. Eastside Brewers will be serving up local suds at Jennie Cooks‘ “Make It & Take It” holiday pie making party Sunday, November 22nd (11-5pm). Also there for the afternoon will be Triple Chicken Foot playing Old-Time fiddle and banjo tunes. 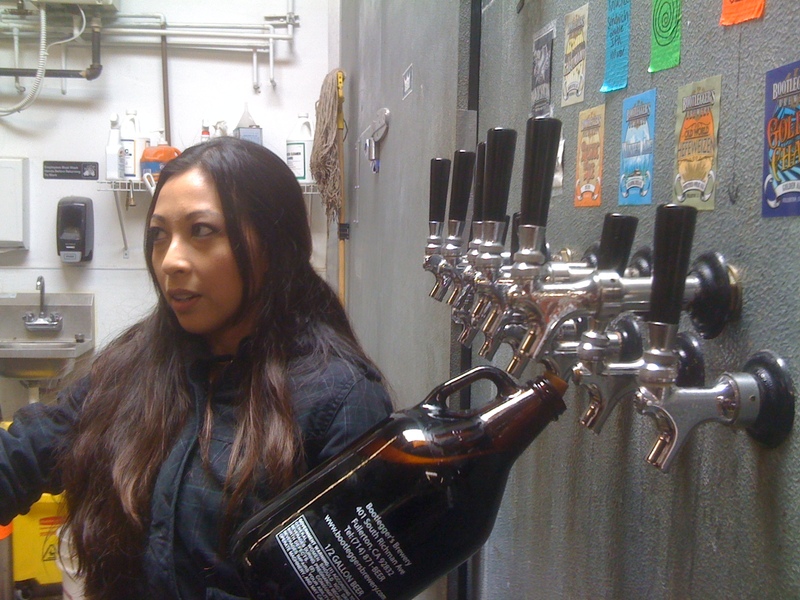 Jennie has all the ingredients and know how, you just need to bring inspiration, a glass for beer, an apron, a pie pan. You can find all the info for the event at Jennie’s Blog. Or call/email Jennie: 323.982.0052 or jennie (at) jenniecooks.com. 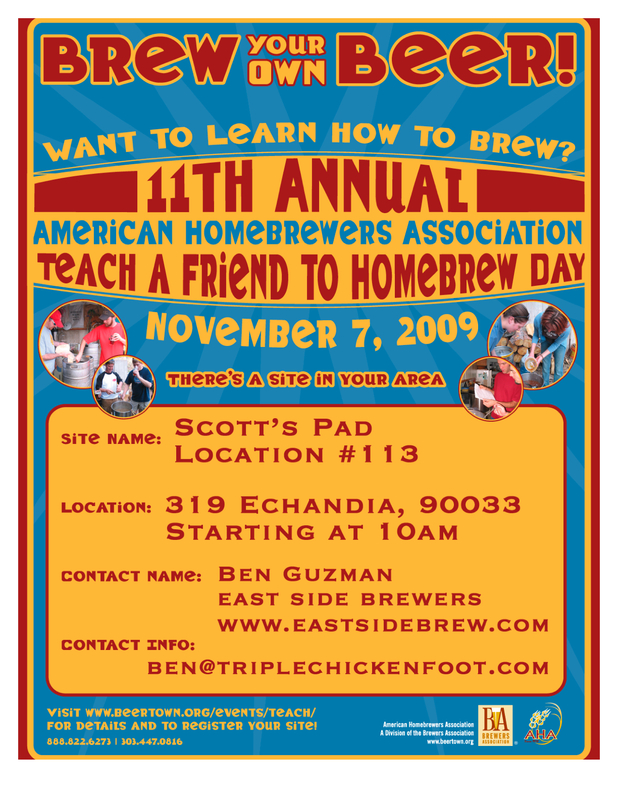 Teach Your Homie To Brew Day! Click the image for a larger version of the flier. The great thing to brewing - is there can be a lot of down time.